You are probably prefer to have your own business rather than working outside or one of people that tend to take home some of work whenever possible. Of course, Nowadays technology has allowed people to work from home. Working at home is obviously rather different from working in your office cubicle and it tends to give you far more comfortable so that you can be more concentrated and at times allows you to get a lot more flexibility. 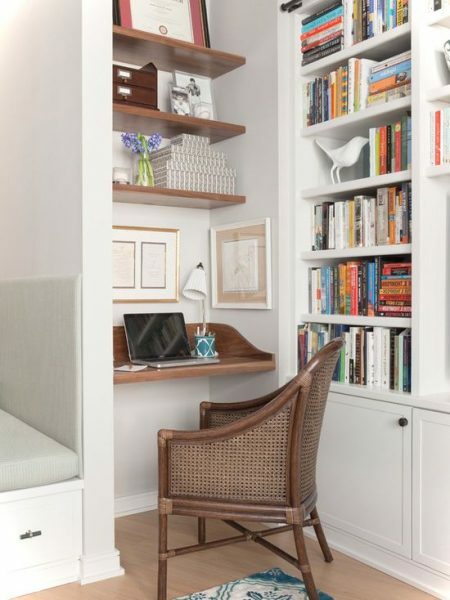 While many new home owners are planning for a dedicated home office room, there are others that are turning the available little corner or space into a work station. Here are my list of small home office for those who are challenged for room and wish to have a decently organized work space. 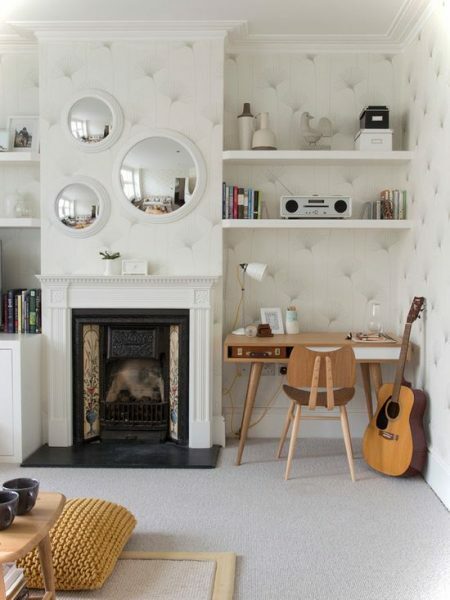 Of course, this idea will make your room look more spacious and comfortable that combines form with function. 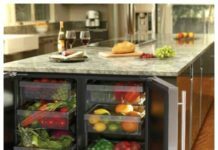 You will be surprised at the number of uncanny pots and multitasking décor that make this a possibility. Brown wooden desk and cream cabinet blend together and create elegant but warm environment. Big window also provides this small office with better air flows. And sometimes when you got stuck at work, by looking the worlds from the windows may freshen up your mind. 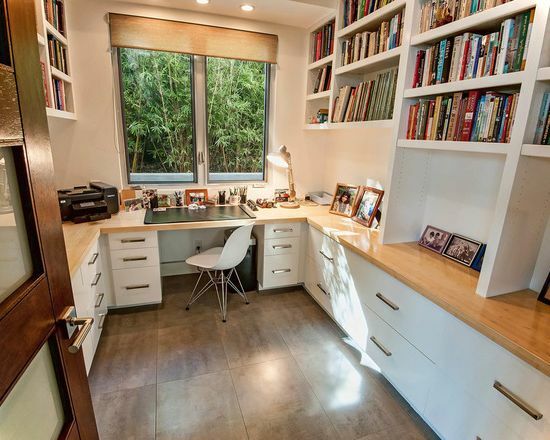 Encino contemporary small home office built with many shelves/cabinet, could really use space for books and filing. Visually appeal office under tilt roof or attic room. Has many storage that help you to organize documents and stationary with style. Put some herbs or flowers to liven the space. Simple but cute little office design. Golden standing lamp and the painting brings luxury with small efforts. Another small home office placed next to window. Gives free air and sun light into the room. 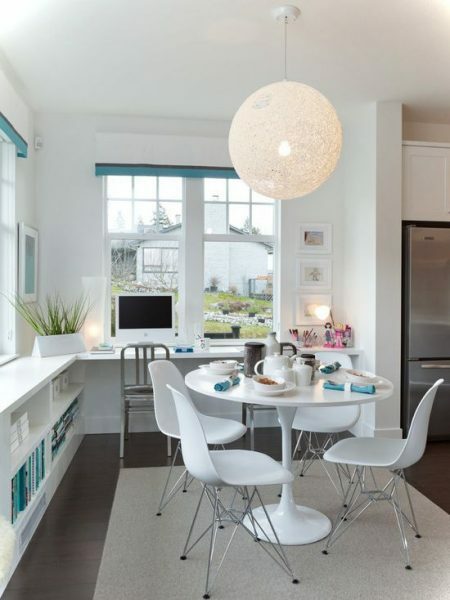 White theme color make spaces bigger visually. Vertical on each corner also give character to the design bring more functional. 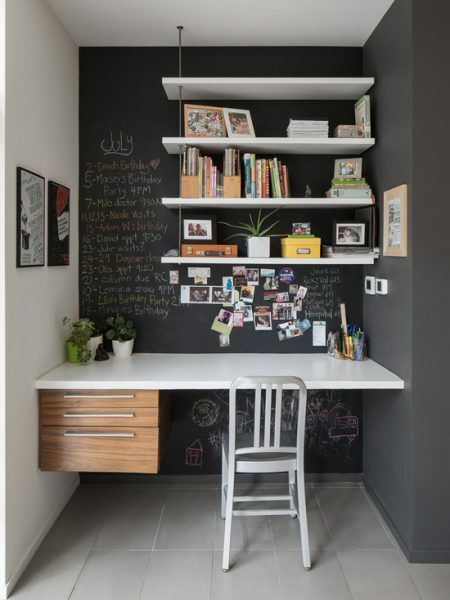 Eclectic small home office in New York with blackboard side and a freestanding desk.The Blackboard actually are door for the storage/closet.Not only its matched with office furniture but also corroborate the theme. Full blackboard on the front wall. You even can draw your mind map here. One word to discribe this small home office. ‘Beautiful!” White and green color theme, rug, unique table lamp and tree wall sticker create perfect combination. A tiny writing desk and full-height bookshelf punctuate this contemplative living room, where many things do multi-duty. The rattan chair works as a desk chair here and as extra seating in the living room. Clean workspace with lots of storage. It doesn’t take much natural light to fill the work space and boost your moods. 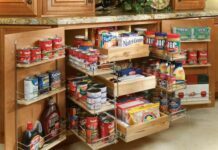 The cabinets provide enough storage space to keep. Working next to the windows you have, lets improve your productivity on small home offcie. 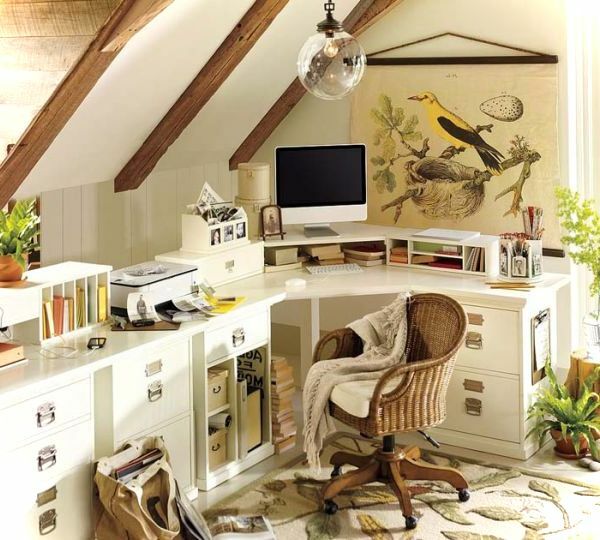 Very well organized and efficient small home office design. 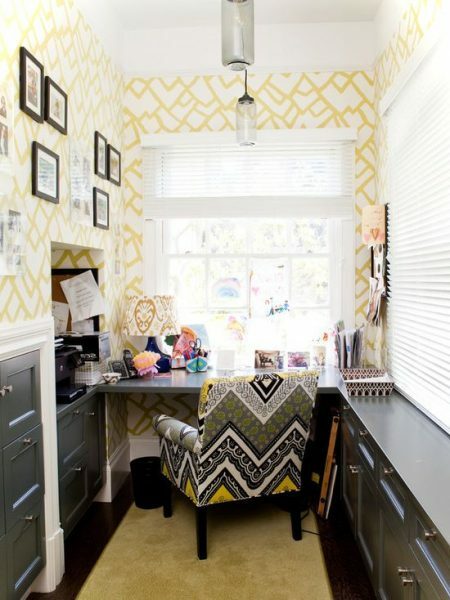 Perfectly light placement and Bold wallpapper pattern make this tiny office more noticable. 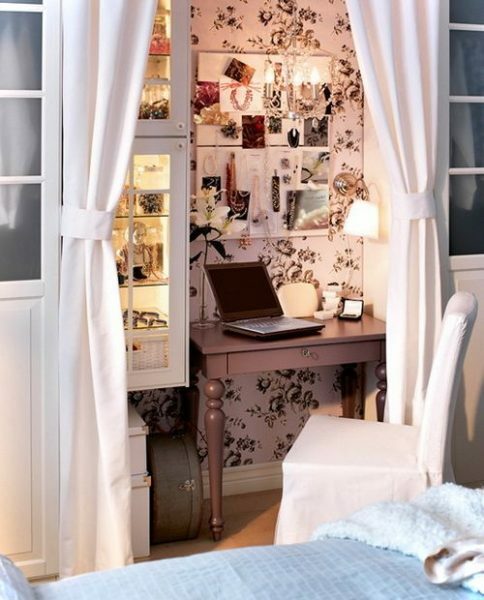 Absolutely elegant small home office. The desk directly placed facing the town through the full height windows. The bookshelf bring “unique” into the design. Its hard to be bored while working in this office. 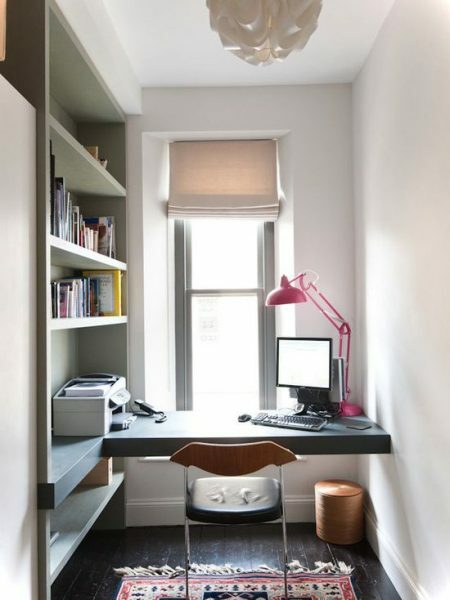 Place an office chair into the corner L-Shape desk takes advantage of space. 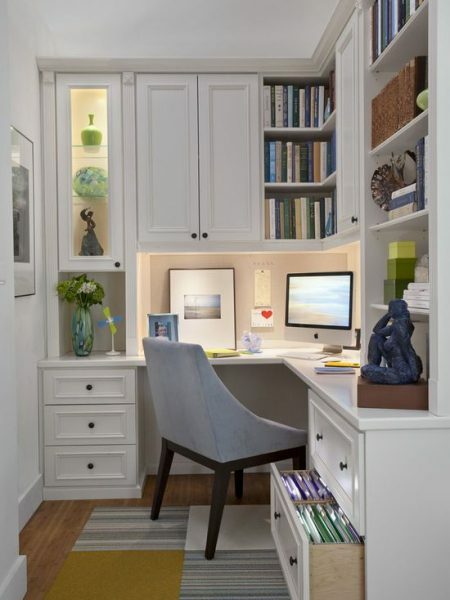 The full height cabinets create enough storage space to keep the office cramped. 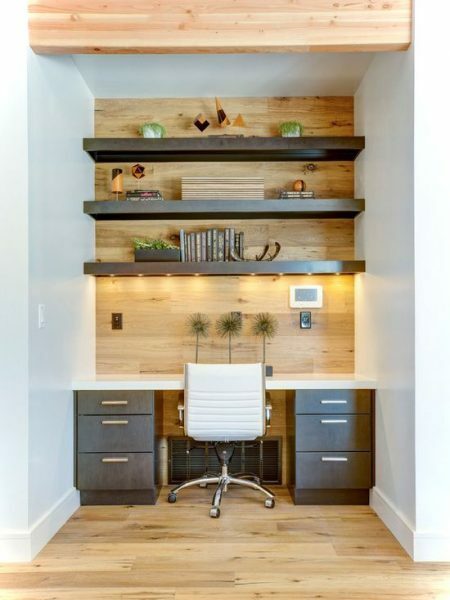 Lighting and sclupture made this design small home office more likeable. 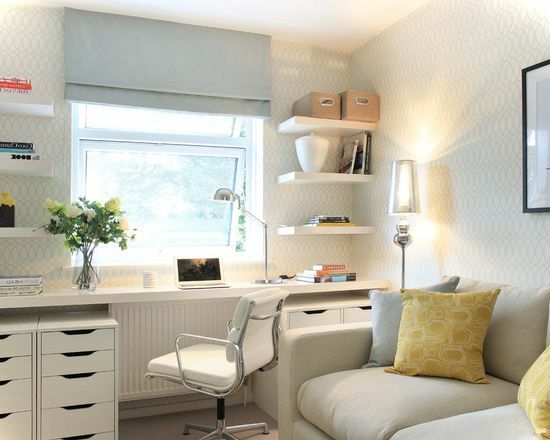 This stylish small home office design will catch the attentions from your guest. 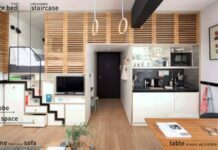 Vertical storage also create noticeable character into this design. Floating table and desk chair is all you need to create office on your home. You might also put this office at “eat on kitchen” like picture above. All furniture and computer sets comes with one color themes. Another small tiny office that pushed into the corner. The retro furniture used on this design are so awe-inspiring. All matched perfectly and unique. Like the other design above. 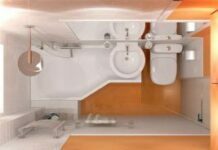 This is also maximize every inch space efficiently.